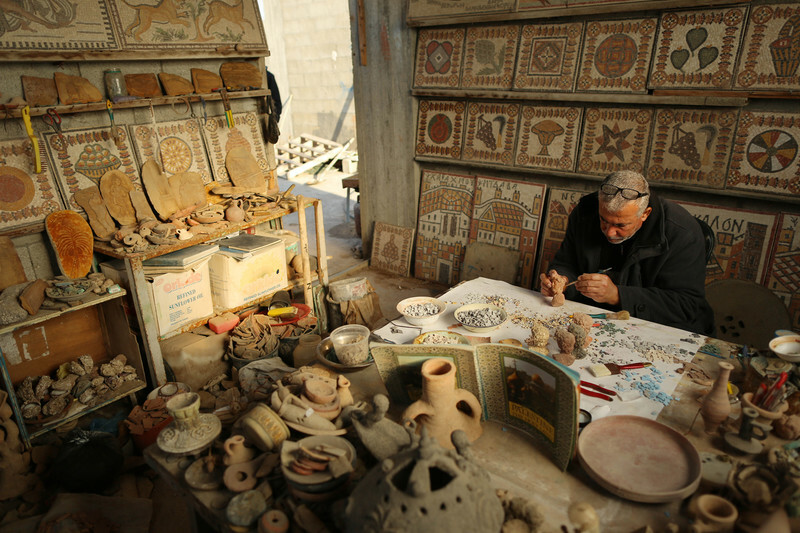 A small room on a rooftop in the occupied Gaza Strip's crowded Beach refugee camp resembles a miniature archaeological museum. Abed copies antiquities photographed in history books and those he has seen during visits to archaeological sites across Gaza, which many a civilisation has passed through, as well as in other Arab countries and Europe. “I started collecting and copying artefacts one year after my release from Israeli prison in 1987,” Abed said. Israel accused him of being active with the leftist Popular Front for the Liberation of Palestine. The artefacts he copies range from the Greek to Islamic eras, and include mosaics, coins, buttons and pottery. “I seek to found a museum to display our heritage and bridge the gap between lovers of heritage and the eras that can never be returned to,” Abed said. But Gaza's modern situation imperils Abed's work towards preserving the legacy of this historical gateway between civilisations. “During the last war, I was terrified for my sculptures; they're very close to my heart,” he said. The biggest obstacle to Abed's work is Israel's blockade on Gaza, imposed for nearly a decade, which prevents the importation of raw materials Abed needs for his work. Egypt's closure of the Rafah crossing — the sole point of exit and entry for the vast majority of Gaza's 1.8 million residents — isolates the coastal strip from the rest of the world. It prevents artists like Abed from exporting and exhibiting their work abroad. But Abed's workshop has become a destination for Gaza's few foreign visitors, as well as Palestinian collectors. “Dutch, American, Polish, French, German and Swiss delegations visited this small room,” he said. “The monuments of Gaza are in danger as a result of the consecutive wars, siege, the limited roles of the responsible authorities, and the lack of societal awareness,” he warned. Israel has damaged and destroyed historical sites and appropriated them to expand settlements and its control over the land. A spokesperson for the tourism and antiquities ministry in Gaza said it did not have enough resources or expertise to restore and take care of the enclave's antiquities.